This study is about Georgian Internally Displaced People (IDPs) from the breakaway territory of Georgia known as Abkhazia, who are now living in other parts of Georgia. 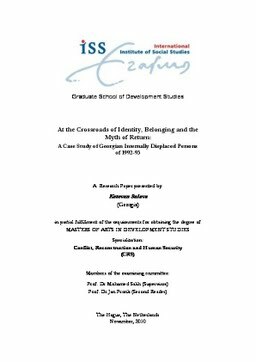 The research considers the different perceptions of the Georgian IDPs of „return‟, „identity‟ and „belonging‟ through an analysis of the narratives of pioneer and second-generation IDPs. Among those interviewed for the research were IDPs, including teachers, NGO workers, parents, youth, in addition to government officials and school principals from mainstream schools, some of whom were „local‟s‟ (non-IDPs). The key finding is that IDPs‟ narratives of return are tied to demands for full reintegration of Abkha-zia into Georgia. Another finding is that the whole question of return, home and belonging of IDPs has become a strong theme in public politics in Georgia as a whole. This narrative is now used by the government to promote its own territorial and political goals. Media campaigns reinforce narratives around what has become the „myth of return‟. The study concludes that the consequences for IDPs are that they are unable to resolve questions of belonging, home and return, because of the complex ambiguity in Georgian public life surrounding the myth of return.